- yachting, bike riding, etc. We enjoy 3 unique advantages which we turn into various entertainment & recreation facilities for you. Riviera Holiday Club covers an area of 12 hectares amidst a wonderful park with century-old trees. The resort is situated in immediate proximity to the beach, offering private beaches in sheltered bays. The climate here is like a natural inhaler. Besides the healing properties of seawater, we have a natural mineral spring. The architecture and infrastructure of the resort are entirely submitted to nature. This concept has become a fundamental one for all subsequent renovations of the holiday club resources and facilities. - Proximity to the big city! 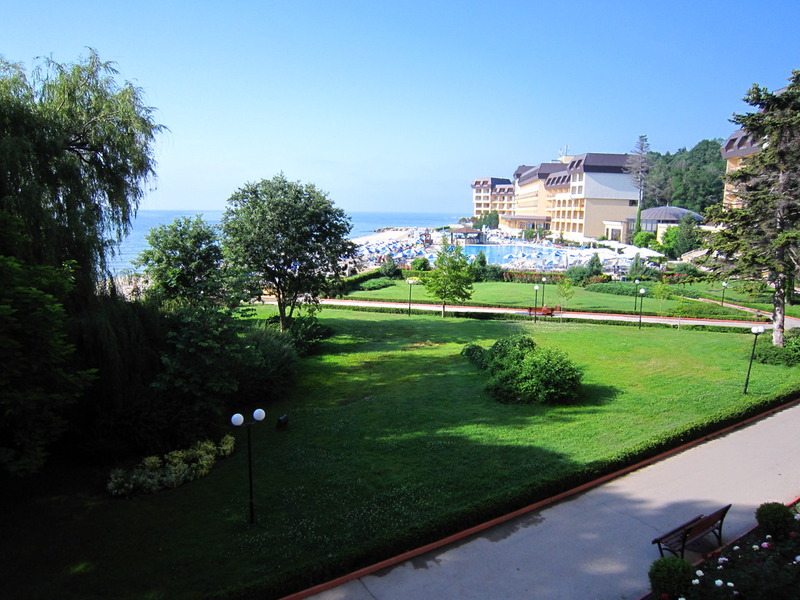 Our modern tourist resort is only 17 km away from the city of Varna- the biggest city in Northern Bulgaria and on the Black Sea coast. This means you will have a wide choice and easy access to all kinds of transport, entertainment and cultural events. Varna International Airport is opened all year round offering scheduled and charter flights to over 35 destinations. Varna Railway & Bus Stations provide comfortable transport connections to regular domestic and international routes. - Proximity to various entertainment facilities and attractions! Interesting places to visit in Varna: the 100-year-old Aquarium, the Dolphinarium, the first Space Center in Bulgaria, and the Archeological Museum famous for the exhibition of the oldest gold in the world discovered in Varna Eneolithic Necropolis. Very close to Riviera Holiday Club, along the road to Varna, you can see the famous rock monastery called Aladzha Monastery. Within a radius of 50 km (30 min to 1 h by car ) you can visit: the town of Balchik where the famous Palace of the Romanian Queen Maria is located; Kavarna town- the so-called "rock music capital" of Bulgaria; Kaliakra cape - a natural and archeological reserve and recently a famous golf-tourism spot; the nearby Dalboka area- famous for its mussels farm; and Bolata area - a 6-km-long canyon with rare flora and fauna and numerous caves; Yaylata - an archeological reserve where a cave town dating to 5000 BC has been discovered; Kamchia biosphere reserve, and others. Please read hotel reviews, promotion, bookings and choose from our hotel list the best hotel deal for your summer holidays in Riviera Holiday Club.